In an attempt to protect his earnings from the taxman, Paul McCartney's financial advisors suggested he invests in property. On this day his purchase of High Park Farm in Campbeltown near the Mull of Kintyre was completed. The three-bedroom farmhouse had an asking price of £35,000, and came with 183 acres of land. It was previously owned by a local farmer, Mr Brown, and his wife, who had lived there for 19 years before moving to Campbeltown. It's 200 acres and a farmhouse as well. It was well worth the money as far as I'm concerned. But don't think I'm a big property tycoon. I only buy places I like. The farm was in a largely dilapidated state. McCartney's girlfriend Jane Asher had encouraged him to buy the property as a refuge from Beatlemania, although it wasn't until he married Linda Eastman in 1969 that renovations began. Linda said, "We could do this place up!" And I'd never thought of that, I thought it just stayed how you bought it. I just wasn't enterprising enough to actually think, We could clean this place up! Linda really turned me on to it. I quite liked it before, I liked its isolation and I liked the privacy and the end-of-the-world remoteness compared to a city. High Park Farm was situated at the top of a hill near a small loch, and overlooked Machrihanish Bay. The Mull of Kintyre was, of course, popularised by McCartney in Wings' best-selling 1977 single of the same name. 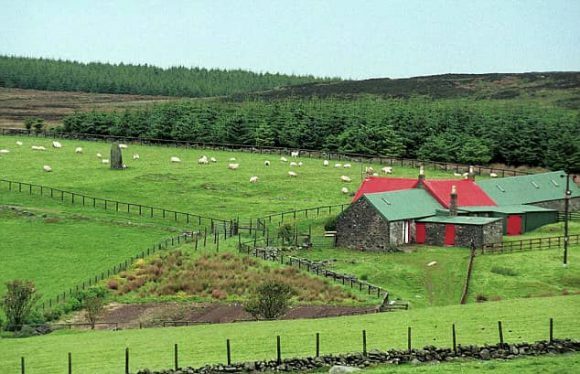 McCartney allowed a neighbour to graze his sheep in exchange for keeping an eye on the property. McCartney later bought the nearby Low Park Farm in an attempt to discourage sightseers from visiting the area. When Paul McCartney dies, his home in Scotland, will become a shrine to the man! I’ve been there and walked all around both low & high park farms. It’s a wonderful place to visit, a bit hard to get too. But well worth it. I’m not sure where all of his homes are, but since buying that farm so many years ago, he has sort of become a property tycoon. He still has his house in London, the ranch in Arizona, a home in in California, and his newest home with Nancy, a penthouse very modern home in NY. And that’s just what’s on the top of my head. He was advised to buy the farm initially to avoid having too much liquid cash and losing it to taxation. One thing can be said, he has never had one big ostentatious estate. He seemed to like to keep his homes away from home on a smaller cozier size. He may have had a lot of land, but the houses themselves apparently were very humble considering he could pretty much buy anything. Oh…and I did read that he held on to the house he bought for his father. I’m not sure if he still has it. The song “The Long and Winding Road” was inspired by his trips to High Park Farm. From the looks of the area on Google Maps, that seems to be an accurate quote. In 1984 when I was towards the end of my enlistment in the US NAVY, I was fortunate enough to score a 4-5 day liberty pass from PA. to NAS Machrihanish in Scotland. It was a pretty long flight over there and tried to sleep most of the way there on the floor of out NAVY aircraft. When we finally arrived, it was about mid morning and the weather seemed dreary and damp. The barracks were something out of the past but were more than comfortable to lay our heads down at night. I tried to get my bearings and try to make the best memories possible during to brief time in grand ol’ Scotland. The initial pan was for most of us to scope out the surrounding area and head into town. What a great place, like stepping back into history although it had all the modern offerings. I just felt so much tradition walking through town, seeing what looked to be older buildings and cobbled streets. I do remembering one day stopping into a pub ( and come to think of it, that might have just been it’s name too. The pub) and having a beer, and seeing one of my shipmates sitting at a booth trying his hand at Haggis.On another day I wandered down the street and ended up around the docks, it was about noon time I guess because they started to play what seemed like the Scottish National Anthem over the speakers there, as I found a nearby vendor and got fish n chips for lunch. It was a sunny day, and a gentleman who was close by asked me if I was from America. I said that I was and he started telling me of a time in years past that he had visited Philadelphia. I felt honored to be able to interact with someone who lived there in Campbeltown (which was not too far outside the base) as I knew that it would make for a great memory and it did. I had heard long before the trip that Paul MacCartney had a home in Scotland. It was when the story of some of the guys getting to dance with Paul’s daughter at one of the pubs, along with a cab driver pointing out Paul’s jet as it flew over the town that I thought that this trip could be more memorable than expected! It was about the last day that we were there, that I had made the decision to find out where the Winged Beatel had his home. Not that I wanted to impose on him but one always here’s of the unexpected meetings with clebs, and how can it happen if you’re not there?! So stocked up with a camera and soda, I hired a cab to take me to MacCartney manor. I should have know it was a long shot when the driver asked me where I wanted to go and when I told him he asked “Why?! and saying that I don’t want to go there, that there’s nothing to see!” I felt confident though and said that’s where I wanted to go, figuring that perhaps I could see the famed farm. After a brief ride, I notice that the cabbie is pulling up to a stone wall which had an older gentleman, with a shotgun no less standing by an entrance that seemed to only lead into a vast field. The two men say hello and the older gent asks what brings us out here? The driver tells him” The Yank wants to see Paul MacCartney! Well, as they both had a good chuckle at my attempt, I quickly realized that my chances of seeing the farm was far from happening. The old gent then said that Paul wasn’t home which could jive with what the earlier in the week cabbie said about Paul flying over the town when he leaves or returns to the area. Home or not, my quest was over and I said to take me back to the base. The driver said that I didn’t have to pay for the ride as I guess since I didn’t get to fulfill my plan but wanting to leave a good impression as a US sailor I insisted and paid the fare. Well, returning to the base I hear a buzz about Paul MacCartney being allowed to park his jet at the base. ” No kidding?” I said” “Then the shipmate tells me that Paul was there and had autographed some of the guy’s.military ID’s! “Ya, well I got to meet Paul’s back field gate guard… or more likely some old Scottish gent who happened to be in the back 40 of his own land, grouse hunting! This story has never been told. In 1971, another girl and I, having planned a “Beatles” trip with time to try to find Paul in Scotland, ended up staying at a bed & breakfast in Campbeltown, Scotland. Unbeknown to us, Paul’s Uncle and Aunt were staying there too, but during introductions at breakfast, we could not understand the host’s Scottish brogue and didn’t realize what he said! We were too young to rent a car (19 & 20) so walked everywhere, enjoying the incredible countryside. But misjudging the weather, were in a downpour about 2 miles from town when a small car with 4 people stopped and asked if we needed a ride. They were staying at the bed & breakfast, and recognized us. We squeezed 6 people into a 4 seat car, I sat on his lap, only to discover later it was the McCartneys and friends traveling with them! Long story short, we became very close friends for over 30 years, wrote, called and visited and stayed with each other in their home in Liverpool and mine in Ohio. They were incredibly friendly, open, caring wonderful people with a great sense of humor and lots of wonderful stories! Getting back to Campbeltown, we did actually find and get on Paul’s farm, walked up to the door but no one was home. Seems Linda had suddenly gone into labor with Stella, and Paul had to get her to London for a difficult birth, which was why his family were staying at the B&B – instead of his farm. Duncan used to be the caretaker, and kept people away protecting their privacy. You probably met him. And yes we heard he was armed but he never saw us girls. That’s a great story! Thanks for sharing it. i was escorted off Property by Paul on horseback in 1971. Not happy with is trespasser! I did sneak by old farmers house, but caught on the way out… He and his wife invited my wife and I in for tea. Great Day!